It's the most wonderful time of the year! Well...almost, but it's definitely time to start thinking about making those Christmas cards that you always say you'll get a jump on! Catherine's got you covered with the newest Stamp Of Approval Collection, Home for the Holidays. We're going to get right into some of the goodies I used today, but if you've not heard about the Stamp Of Approval collections before, let me just tell you...you've been missing out! Catherine Pooler Designs releases a quarterly Stamp Of Approval collection which is chock full of exclusive products not available to purchase in the store. All of the products in the collection coordinate and can be used together or on their own to create TONS of projects. Each collection is limited and when they're gone - they're gone. No restocks and the products won't be available for purchase for a long time. Okay! Let's get into the fun! Click the graphic below to go to the live SOA link! I made tons of cards with this collection but not many of them kept in with the traditional Christmas colors. I wanted to make sure I created at least one that just screamed "CHRISTMAS!" with reds, greens, and blue, too. This card is my screaming Christmas card. 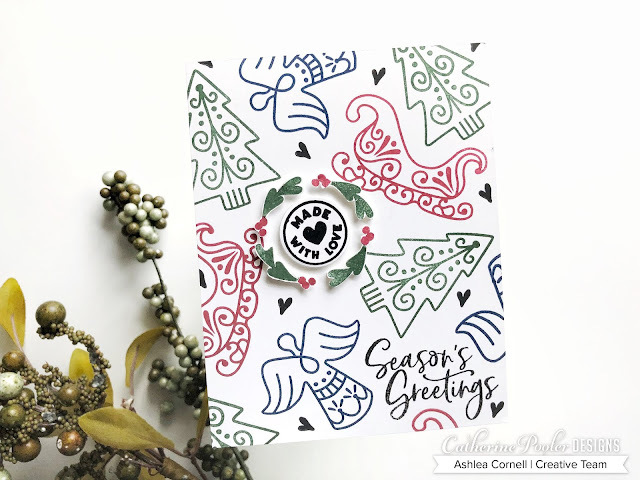 I used the seriously fabulous Sugar Cookies set and stamped the tree, sleigh, and angel image around the card front in CP inks Spruce, Peppermint Scrub, and Juniper Mist. These colors really help to drive home the traditional christmas feel. I used Midnight ink to stamp the little hearts that come in the Festive Trimmings set along with the sentiment Season's Greetings which is included in the Holiday Mix set. Finally, I stamped and die cut the "made with love" circle and adhered it with foam tape surrounding it with fussy cut holly images also from the Festive Trimmings set. Happy shopping! I'll see you very soon!